In 1913 the Balfour-Guthrie Company began to plan for the construction of an irrigation system that would bring water to Diablo Valley farmers. The East Contra Costa Irrigation District, comprising 20,000 acres of level, fertile land in the heart of the valley was the largest irrigation unit in the Diablo Valley. The E.C.C.I.D. drew its water supply from a branch of the San Joaquin River. The water travelled through a series of pump stations, the highest point being 140 feet above the river, and was lifted through seven pump stations. 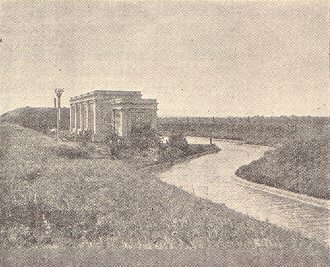 The highest pump station was located at the west end of the main canal, six miles from the source, and fed many laterals supplying the lands on either side. With the completion of the irrigation system, alfalfa growing became popular in addition to the existing dry-land grain farming. Then observers found that all the elements for a successful fruit district were present in the Diablo Valley: water, climate, soil, proximity to market and excellent transportation. Orchard farming became popular. 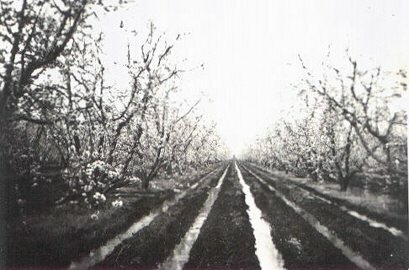 Orchards were originally flood irrigated. Today the Wolfes irrigate with sprinklers.